The Difference a Fire Door Makes! This picture really illustrates how important being prepared for a disaster is but also how effective fire doors are. In the first pic with the door closed you can see some soot on top of the door but not much else damage. In the second photo you can see the devastation from a fire. Fire doors aren't always this effective but in this instance you can be sure that the owner of the building was glad they installed it! Summertime is a great time for taking time off and going on a vacation! Unfortunately many people come home from their R&R and find out that a pipe broke right after they left for a week. When we arrived on site a pipe in the ceiling of this home had broken pretty early and sprayed water collapsing the ceiling and soaking into the basement. Mold was growing on the ground and basement levels and as you can see it was so humid in the home that the ceiling fan began to melt. Luckily because we are experts at both water and mold damage we were able to take care of both problems and get them back to normal quickly. SERVPRO of Northeast Wichita likes to be innovators in the restoration industry. 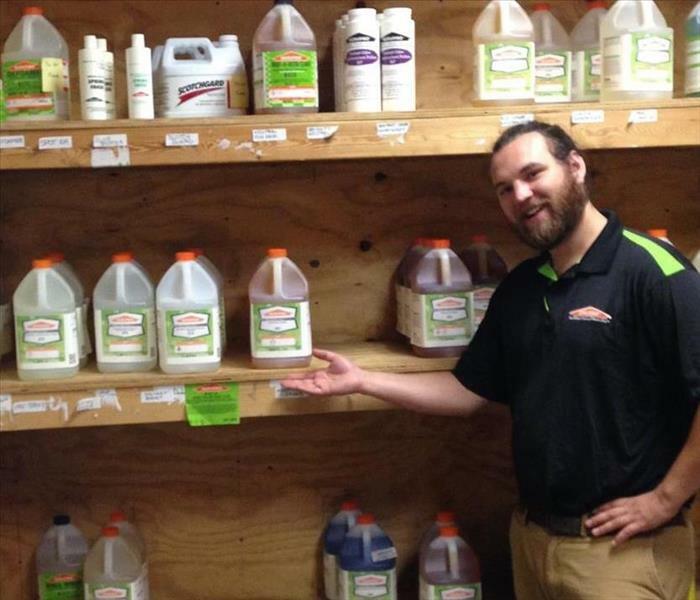 Part of that innovation is our partnership with the SERVPRO chemists! 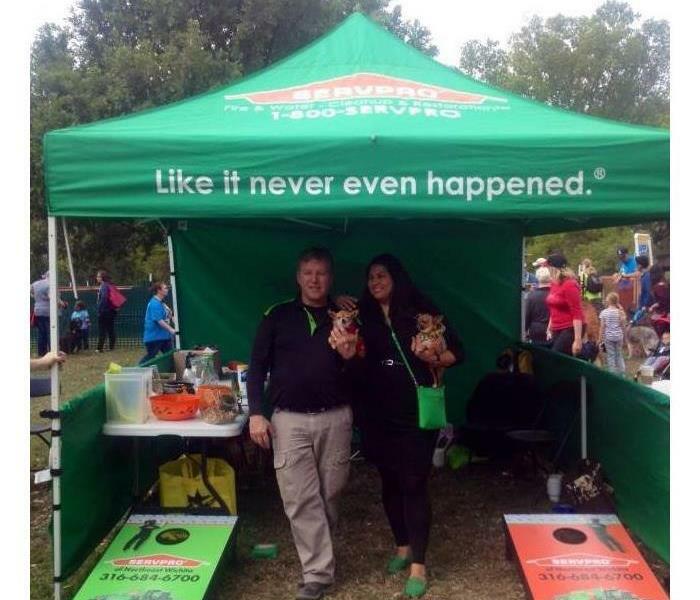 SERVPRO of Northeast Wichita is part of a much larger SERVPRO family, and that affords us the ability to reach out to our wonderful restoration scientists. There they've tested and accumulated recipes to take of just about every stain and smell one could imagine! Runaway deer in the living room; there's a recipe. Stinky sewer water on the walls; you better believe we have a remedy for that! Stubborn smell form a fire; literally no match. SERVPRO of Northeast Wichita has a wonderful team of professionals and technicians who have made the restoration process a SCIENCE! 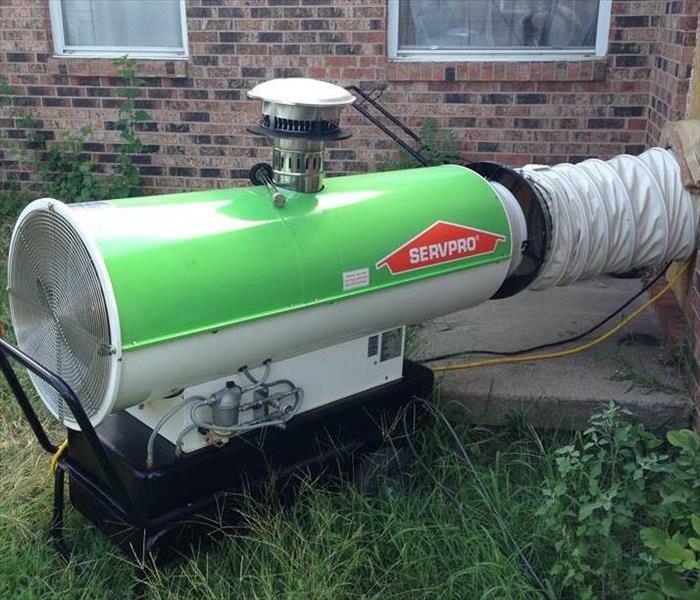 SERVPRO of Northeast Wichita is the ONLY restoration company in town that has this fantastic piece of equipment! No, its not a laser, but it can eradicate mold and moisture in areas like your crawlspace. Pumping temperatures as hot as 120 degrees, there's nothing that can hide from it! Let the professionals like SERVPRO of Northeast Wichita handle your water and mold issues and you might see this BEAST in action. We have been raising money and participating in the Kansas Humane Societies Woof stock for 4 years now and we are gearing up for 2017's Woofstock! Keep your calendars clear on October 7 from 9:30 -3:00 and come on down to the Sedgwick County Park where there will be music, food, fun and tons of dogs! It's great time for dog lovers and all the money goes to support he Kansas Humane Society which is completely privately funded and helps over 15,000 pets a year find forever homes! Floods in your crawlspace can cause wood rot, odors and even mold growth. Besides that water left to ferment beneath your home becomes a hot bed of microbes which harbor all kinds of viruses and bacteria. Good thing for Wichita we aren't afraid to get dirty. 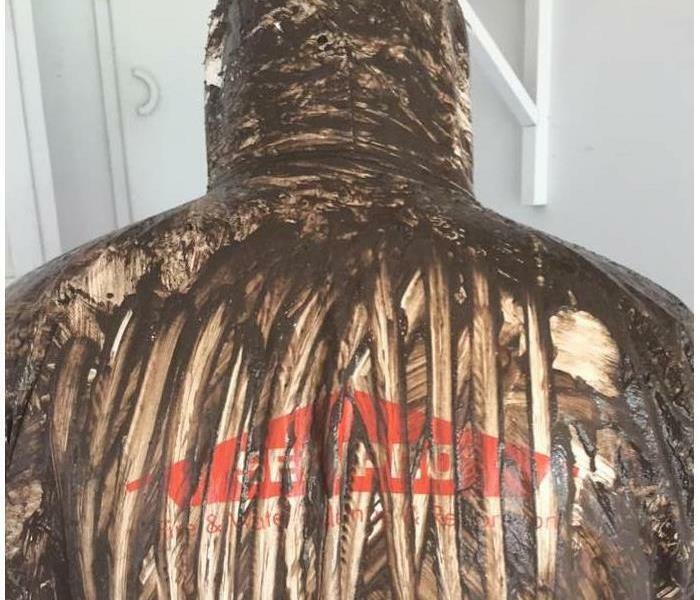 This is what one of our technicians looked like after climbing out of such a crawlspace after having pumped out all the standing water we went in there after all remaining water with our hoses. Following that we dried the floor joists and set up a vapor barrier to prevent moisture from damaging the building materials in the crawlspace. This is our crew working after hours to box up the contents of people whose apartments were left impossible to secure following a fire. We received the call after what was already a pretty tough day of work here at SERVPRO but everyone pitched in, including our owners, to safely pack, transport and store all the contents from 3 separate apartments in 3 separate vaults back at our building by the end of the evening.